The Enfield Food Shelf is set up in a way to make those who use it feel like they are visiting a grocery store, rather than a food pantry. Along the aisles at the Enfield Food Shelf, you’ll find people like Paul Randall. “Pick up what I like and what I need for the week,” Randall said. It’s that option here that sets it apart from other food pantries. 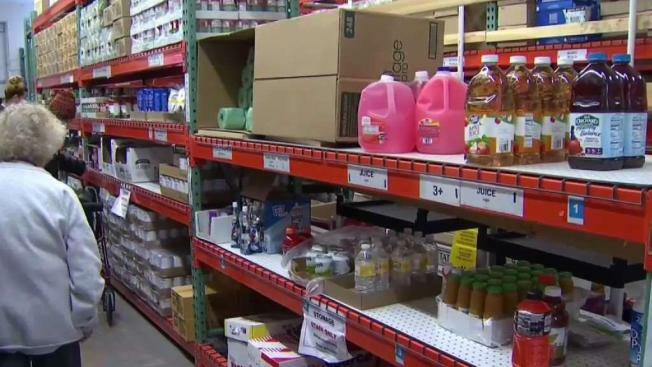 “That is one of the main things for us to provide that very dignified experience to provide an experience that’s very social,” Kathleen Souvigney, executive director of Enfield Food Shelf said. The grocery store like set-up helps families choose what they need for the week for free. “This way they can self-select based on their family needs as well as their medical needs and their likes and dislikes,” Souvigney said. Souvigney says the Enfield Food Shelf serves 340 families a week and the demographic demand is changing. “I would say our most growing need is a family with younger children to perhaps both the parents are more or less working but they’re working in a job that is not a salary job,” Souvigney said. The lifting is heavy to keep food on these shelves. Souvigney says it provides 600,000 pounds of food a year. The pantry depends on monetary donations, along with food drives and donations from retailers and FoodShare. “Some of the families they actually need a lot of this food it’s good that they have a lot,” Randall said. Patrons like Paul are grateful for the donations that allow him and hundreds of others to shop for what they need when money is tight. “Every little bit helps when you can do it,” Randall said. You can help food pantries like Enfield Food Shelf by making a donation this Saturday, April 10 at the Feeding our Families event. It’s happening from 9 a.m. to 6 p.m. at Stop & Shop locations across the state.